Paceline Products, Inc. H2CARMELA - They fit comfortably under helmets and are great headbands for men or women. Featuring the patented sweat seal grip technology and dry line fabric, this athletic sweatband will redirect sweat and moisture away from your eyes and face. The halo ii - pullover sweatbands are great for running, cycling, or virtually any other activity that will work up a sweat. No more burning sweat in your eyes. Dry line fabric absorbs, wicks, and quickly evaporates moisture. Grip technology holds the headband in place. Made in the USA. The sweat seal channels sweat back and away from your eyes and glasses. The halo ii pullover sweatband is our best-selling headband. Will not lose shape, form, or stretch out. Halo II Headband Sweatband Pullover, Carmela - . Pullover headband featuring our patented sweat Seal grip technology. - Will not lose shape, form, or stretch out. Made in the USA. No slip-4" wide pullover-features No Slip Grip Technology to keep this headband in place during any activity. Universal fit-our bandit is 4" wide in the front and tapered in the back; custom designed to fit any size head comfortably, putting very little pressure on your head, while keeping the Bandit in place.
. Sweat channeling sweatband-our patented sweatseal channels sweat back and away from the eyes allowing you to focus on your workout without sweat dripping into your eyes or onto your glasses. Moisture wicking headband-fabric absorbs, wicks, and quickly evaporates moisture. Halo Headband Sweatband Slim, 1"
- Sweat channeling sweatband-our patented sweatseal channels sweat back and away from the eyes allowing you to focus on your workout without sweat dripping into your eyes or onto your glasses. Maximum absorption - dryline fabric absorbs, dries quickly, wicks, and is antimicrobial kills odor-causing bacteria. Stop the burn - no more burning eyes from salty sweat dripping in them. Made in the USA. No slip-4" wide pullover-features No Slip Grip Technology to keep this headband in place during any activity. Moisture wicking headband-fabric absorbs, wicks, and quickly evaporates moisture. No slip-pullover - 1" wide headband featuring our patented Sweat Seal with Grip Technology. Halo Headband Sweatband Slim, 1" - Unisex design - Made in USA. Grip technology - holds the band in place and keeps your hair back under the most extreme activities. Patented sweat seal - the Sweat Seal channels sweat back and away from your eyes, face, and glasses. Will not lose shape, form, or stretch out. Universal fit-our bandit is 4" wide in the front and tapered in the back; custom designed to fit any size head comfortably, putting very little pressure on your head, while keeping the Bandit in place. Halo Headbands HSCBLK-PARENT - The micro-mesh top breathes extremely well and keeps your head cool. Unisex design - Made in USA. Sweat channeling sweatband-our patented sweatseal channels sweat back and away from the eyes allowing you to focus on your workout without sweat dripping into your eyes or onto your glasses. Black, camo grey, camo green and star gazer offer UPF rating of 50, White has UPF rating of 35. One size fits all pullover design. Fits comfortably under any helmet; perfect for Mountain Biking, Football, Lacrosse, Motorcycle, Road Cycling, Hockey, and Hard Hats. Made with the amazing dryline fabric, this fabric absorbs sweat, wicks moisture, dries quickly and is antimicrobial kills germs that cause odor. Halo Headband Skull Cap - The Ultimate High Performance Skull Cap - Made in the usa with the very best quality construction, fabrics, and design. Will not lose shape, form, or stretch out. Moisture wicking headband-fabric absorbs, wicks, and quickly evaporates moisture. No more burning, stinging eyes from sweat or sunscreen!4-way stretch mesh fabric conforms to your head for a comfortable smooth fit. Grip technology holds the cap in place during any activity. Maximum absorption - dryline fabric absorbs, dries quickly, wicks, and is antimicrobial kills odor-causing bacteria. Stop the burn - no more burning eyes from salty sweat dripping in them. Halo Headbands HRED-Parent-P-0 - Patented sweat seal - the Sweat Seal channels sweat back and away from your eyes, face, and glasses. Sweat stopping sweatband-this headband doesn't just absorb sweat, face, our patented SweatSeal channels sweat back and away from the eyes, and glasses. Non slip grip technology-will not slip; holds the band in place and keeps your hair back during the most extreme activities. Moisture wicking headband-fabric absorbs, wicks, and quickly evaporates moisture. One year warranty against manufacturer defects. Made in the USA. Unisex design - Made in USA. The top provides uv sun protection with upf ratings of 35 to 504-way stretch mesh fabric conforms to your head for a comfortable smooth fit. Halo Headbands Sweatband Halo I Tie Version - Grip technology - holds the band in place and keeps your hair back under the most extreme activities. Will not lose shape, form, or stretch out. Made in the usa, one size fits both men and women. No more burning, stinging eyes from sweat or sunscreen! The design is a headband that ties in the back to create a custom fit for the wearer and includes all the features that make Halo Headbands the best functioning headbands on the market. Design works great under helmets of all types, lacrosse, including cycling, and football. TREAD BANDS TreadBands All Terrain Tieback Non Slip Headband - Solid Colors. Guaranteed to Stay in Place, Keeps Sweat Out of Your Eyes, Patented Grip Technology. HALO HEADBANDS HPROTEXBLACK-PARENT - No more burning, stinging eyes from sweat or sunscreen! This performance skull cap features our patented SweatSeal; this seal RE-DIRECTS and CHANNELS sweat away from your eyes, face, and glasses. The halo protex bandana has a lightweight, effective design that allows for a very comfortable fit. Will not lose shape, form, or stretch out. The smooth mesh top helps keep your head cool even on hot summer days, as well as providing excellent sun protection. Micro mesh top breathes extremely well and keeps you cool; stretches to conform to your head for a comfortable fit; offers UV protection with UPF ratings of 35 to 50 for exceptional sun protection. Halo Headband Bandana - The Ultimate High Performance Bandana - Protex - Grip technology holds the cap in place during any activity. No more burning, stinging eyes from sweat or sunscreen! Patented sweat seal - the Sweat Seal channels sweat back and away from your eyes, face, and glasses. The micro-mesh top breathes extremely well and keeps your head cool. One year warranty against manufacturer defects. Halo Headband HVELBLACK-PARENT - Patented sweat seal - the Sweat Seal channels sweat back and away from your eyes, face, and glasses. One year warranty against manufacturer defects. One year warranty against manufacturer defects. Fits comfortably under any helmet; perfect for Mountain Biking, Motorcycle, Lacrosse, Hockey, Road Cycling, Football, and Hard Hats. Made with the amazing dryline fabric, this fabric absorbs sweat, dries quickly, wicks moisture, and is anti-microbial kills germs that cause odor. Made in the usa with the very best quality construction, fabrics, and design. Design works great under helmets of all types, including cycling, lacrosse, and football. This performance bandana features our patented SweatSeal which RE-DIRECTS and CHANNELS sweat away from your eyes, face, and glasses. No slip-4" wide pullover-features No Slip Grip Technology to keep this headband in place during any activity. 4-way stretch mesh fabric conforms to your head for a comfortable smooth fit. Halo Headband Halo V - Sweatband with VELCRO Brand Adjustable Fastener - No more burning, stinging eyes from sweat or sunscreen! Moisture wicking headband-fabric absorbs, wicks, and quickly evaporates moisture. Maximum absorption - dryline fabric absorbs, wicks, dries quickly, and is antimicrobial kills odor-causing bacteria. Stop the burn - no more burning eyes from salty sweat dripping in them. SAAKA Men’s Fully Adjustable Headband. Sweat Headband for Running, Tennis, Working Out & All Sports. Soft, Comfortable & Moisture Wicking. Halo HSHBLACK-Parent - The sweat seal channels sweat back and away from your eyes and glasses. Grip technology holds the cap in place during any activity. One year warranty against manufacturer defects. Unisex design - Made in USA. Black, camo grey, camo green and star gazer offer UPF rating of 50, White has UPF rating of 35. One size fits all pullover design. Made in the USA. No slip-pullover - 1" wide headband featuring our patented Sweat Seal with Grip Technology. Grip technology holds the hat in place; hook and loop strap for adjustability. No more burning, stinging eyes from sweat or sunscreen! Dawn and evening runners - look for our highly reflective Illuminator Silver Velcro Adjustable Headband! Halo Headbands Sweatband Sport Hat - Ties in the back for a one size fits all adjustable, custom fit. These lightweight sweat caps are great for running, tennis, golf or any other activity that makes you sweat and requires protection from the sun. Patented sweat seal - the Sweat Seal channels sweat back and away from your eyes, face, and glasses. Halo Headbands - One year warranty against manufacturer defects. The top provides uv sun protection with upf ratings of 35 to 50 Pullover design is very comfortable - Will not lose form or stretch out. Moisture wicking headband-fabric absorbs, wicks, and quickly evaporates moisture. Sweat channeling sweatband-our patented sweatseal channels sweat back and away from the eyes allowing you to focus on your workout without sweat dripping into your eyes or onto your glasses. Made in the USA. Universal fit-our bandit is 4" wide in the front and tapered in the back; custom designed to fit any size head comfortably, putting very little pressure on your head, while keeping the Bandit in place. No more burning, stinging eyes from sweat or sunscreen! Halo ii athletic Sweatband is our best-selling headband. Halo II Headband Sweatband Pullover - 2 Pack - 1-Black & 1-White - Grip technology holds the cap in place during any activity. Sweat stopping sweatband-this headband doesn't just absorb sweat, face, our patented SweatSeal channels sweat back and away from the eyes, and glasses. Non slip grip technology-will not slip; holds the band in place and keeps your hair back during the most extreme activities. Black, camo grey, camo green and star gazer offer UPF rating of 50, White has UPF rating of 35. One size fits all pullover design. They fit comfortably under helmets and are great headbands for men or women. Temple Tape - Patented sweat seal - channels sweat back and away from the eyes, face, and glasses; no more burning eyes from salty sweat dripping into them! Sweat stopping sweatband-this headband doesn't just absorb sweat, face, our patented SweatSeal channels sweat back and away from the eyes, and glasses. Non slip grip technology-will not slip; holds the band in place and keeps your hair back during the most extreme activities. Micro mesh top breathes extremely well and keeps you cool; stretches to conform to your head for a comfortable fit; offers UV protection with UPF ratings of 35 to 50 for exceptional sun protection. Universal fit-our bandit is 4" wide in the front and tapered in the back; custom designed to fit any size head comfortably, putting very little pressure on your head, while keeping the Bandit in place. Temple Tape Headbands for Men and Women - Mens Sweatband & Sports Headband Moisture Wicking Workout Sweatbands for Running, Cross Training, Yoga and Bike Helmet Friendly - Will not lose shape, form, or stretch out. Made in the USA. Absorbs & evaporates sweat 8 times faster than an average Cotton Sweatband Specially Blended Materials provide All Grip, and No Slip. They're perfect to be worn on their own or under other hats, helmets and visors. 2 pack of the halo pullover headbands - 1-Black & 1-White Halo Pullover Headbands per order. Unisex - one size fits both men and women. They will absorb and evaporate buckets of sweat eight times Faster than an Average Cotton Headband. Elite Athletic Gear 35+ Designs! Unisex Headband/Sweatband. Best for Sports, Fitness, Working Out, Yoga. Tapered Design. Halo HVBLACK-Parent - The micro-mesh top breathes extremely well and keeps your head cool. Dryline fabric absorbs sweat, wicks moisture and dries quickly. The halo sport visor has a Halo Headband built into the visor, making this one of the most functional visors available. Made in USA. One year warranty against manufacturer defects; made in USA. Moisture wicking headband-fabric absorbs, wicks, and quickly evaporates moisture. The top provides uv sun protection with upf ratings of 35 to 50 Grip technology holds the hat in place; hook and loop strap for adjustability. Fits comfortably under any helmet; perfect for Mountain Biking, Lacrosse, Motorcycle, Hockey, Football, Road Cycling, and Hard Hats. 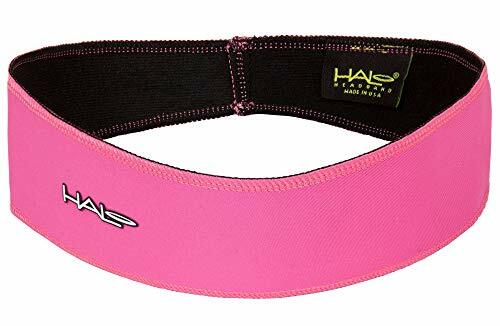 Halo Headbands Sweatband Sport Visor - Made with the amazing dryline fabric, wicks moisture, dries quickly, this fabric absorbs sweat, and is anti-microbial kills germs that cause odor. Made in the usa with the very best quality construction, fabrics, and design. Custom tie fit-men or women's headband will not lose shape, form, or stretch out. Maximum absorption-dryline fabric absorbs, dries quickly, wicks, and is antimicrobial kills odor-causing bacteria. Stop the burn-no more burning eyes from salty sweat. No more burning sweat in your eyes.